Two major projects are coming before Blaine County commissioners and the county’s Land, Water and Wildlife Levy Advisory Board to determine if landowners will be able to count on public funding for two major stream projects in the Silver Creek area. In 2008, Blaine County voters passed a $3.4 million two-year levy to help protect clean water, wildlife habitat and working farms and ranches in Blaine County. Money is granted from the levy funds based on applications from landowners in partnership with nonprofit conservation organizations such as the Wood River Land Trust and The Nature Conservancy. Perhaps the most complex application currently in the works is from The Nature Conservancy, in reference to its proposed project near Kilpatrick Pond in Picabo. 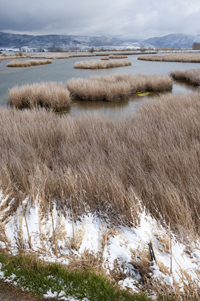 The organization submitted a pre-application to the Land, Water and Wildlife Levy Advisory Board last May requesting an estimated $177,000 for its plan to create wetlands and islands in Kilpatrick Pond north of Kilpatrick Bridge. The project will be carried out on Silver Creek Preserve land and on land owned by Picabo Livestock but under a conservation easement held by The Nature Conservancy. A project in the area currently being proposed by Picabo Livestock President Nick Purdy, which is currently before the Blaine County commissioners, is not being considered for public funding. Clare Swanger, project coordinator for the Land, Water and Wildlife Levy program, said the money would make up about 25 percent of the total project costs, and would mostly be used for materials such as bio-logs to hold silt back, equipment costs, fences and plantings. As of Aug. 31, the organization had raised $160,000 to support the project. Swanger said that the board invited The Nature Conservancy to submit a full application for funding based on its pre-application; however, she said The Nature Conservancy has not yet done so, due to the project’s pending stream-alteration permits. “They are waiting for all the permitting before they submit a full application,” she said. The Blaine County Commission is still waiting for approval of the project from the Idaho Department of Water Resources before making its decision. Swanger said the Purdy family had submitted an application for Land, Water and Wildlife Levy funding for their project, which involves wetlands creation and replacing of a diversion dam downstream of the Kilpatrick Bridge. However, the family later withdrew the application. The other major project before the levy advisory board is a proposal from Loving Creek Ranch to construct a fish bypass channel and fish ladder that would allow fish to more easily migrate upstream and downstream in the area. According to the application, the area contains a 4-foot-wide culvert with a 3-foot vertical drop to the downstream end of a pond, a drop that prevents fish from having access to habitat in the upper reaches of Loving Creek. The nonprofit group Trout Unlimited will partner with the owners of the ranch to construct the passage and fish ladder. The total project cost is $27,779 and the group is requesting $13,500, which will be matched by the owners. The levy advisory board was expected to consider the full application on Thursday, April 18. If recommended, the application will then be considered by county commissioners, who have final approval over disbursement of levy funding.